Nothing changed after this game. Berwick again failed to beat the Citizens in this, the fifth meeting of the teams this season. Once more, Ashley Grimes scored against Berwick. With basement club Cowdenbeath twice coming from behind to draw at Stirling, the points gap between them and Berwick (nine) and City (10) remained the same. 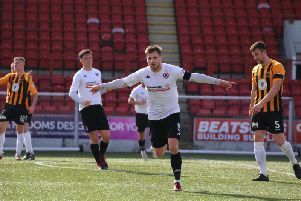 The bright sunshine helped draw more than 500 spectators to Shielfield, but they witnessed a game which clearly illustrated why neither side is yet certain of avoiding the relegation play-off against non-league opposition. Whilst a draw was probably a fair result, there was a dearth of decent football. Such was the frequency with which the ball was in the air that at times it resembled a variant of Australian Rules. However, it was with a shot on the ground that home captain Steven Notman almost opened the scoring in the eighth minute. Rangers then avoided the ignominy of a spectacular own goal when, under pressure from Craig Thomson, Jamie Todd’s attempted back pass to Robby McCrorie was too hard and too high for the keeper giving City a corner. In a rare move of quality, Notman found Paul Willis, who managed an onwards touch to Jack Hamilton but the loanee from Livingston was offside. It looked like more hamstring trouble for City’s assistant manager Craig Beattie as he departed after only 23 minutes to be replaced by Gareth Rodger. Former Berwick player Pat Scullion picked up the first yellow card of the afternoon for an offence against Ousman See. Calum Antell should have comfortably held the free-kick from Willis but instead conceded a corner after which a lack of composure from Willis resulted in his shot from outside the area sailing over the Welsh keeper’s bar. At McCrorie’s end, Grimes’ free-kick was headed wide by Rodger. Together, Todd and Keiran Stewart sufficiently limited Graham Taylor’s options after he progressed into the box but the development loan player from Dundee United gave regular marker Jordan Orru a testing afternoon, the Berwick player twice recovering just in time when Taylor seemed to have the beating of him. For Berwick, Gary Phillips was Taylor’s equivalent, displaying an admirable appetite to try to create something by running at the opposition. Ten minutes into the second half, Rangers scored. A Scullion error was compounded by Antell, who misjudged the ball he ran out to meet, leaving Hamilton, following through, to shoot into an empty net. The lead lasted for barely 10 minutes. After another bout of high ball in a crowded penalty area, when it eventually came to ground, the surefooted Grimes made it 1-1. Referee Duncan Williams was impervious to Berwick claims for a penalty when Willis went down inside the area.